Much like a blind person uses a cane to chart their surroundings, atomic force microscopy (AFM) uses a probing tool called a cantilever to measure the morphology of a sample under examination. Unlike optical and electron microscopes, AFM – a type of scanning probe microscopy – is a powerful tool that measures in all three dimensions, at the nanoscale, to gather precise data about surface characterization, a technique essential to the field of renewable energy. Accordingly, researchers in the Department of Materials Science and Engineering (MSE) and the Institute for Research in Electronics and Applied Physics (IREAP) at the University of Maryland (UMD) - Elizabeth Tennyson (MSE Ph.D. student), Chen Gong (MSE Ph.D. student), and Marina Leite (MSE Asst Professor) – were invited by the editor of ACS Energy Letters to offer a review of the AFM field on both energy harvesting and energy storage materials. The review offers a detailed discussion of AFM use for 1) energy harvesting systems, such as solar cells and 2) energy storage systems, such as rechargeable batteries, to identify electrical, chemical, and optical properties and their impact on device performance. Tennyson, first author on the review, uses scanning probe microscopy techniques – specifically, AFM – in her research on solar cell materials to better understand how the local electrical properties influence the overall behavior of a photovoltaic device. “The goal is to engineer better, higher performing materials for future solar cells, which will ultimately help lower the cost,” Tennyson stated. 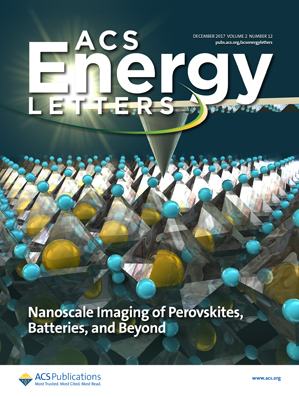 The latter part of the review is devoted to probing research that investigates the electrical, chemical, and optical properties of perovskites – a material that mimics the structure of calcium titanium oxide, and a popular form of energy harvesting. Perovskites are fragile – notoriously sensitive to humidity and oxygen – so, being able to image this material at the nanoscale will contribute to a more fundamental understanding of why they’re so volatile. If scientists can fully understand them, then perhaps they can be used as a next generation solar cell with stable power conversion efficiencies. “The micro- and nanostructure of heterogeneous photovoltaic (PV) and battery/storage materials is well known to influence their overall performance,” the team stated in the review. In order for the field to progress, the team suggests that AFM systems – which allow in-situ characterizations of chemical, electrical, and electrochemical behaviors of batteries and fuel cells – should be a development priority in order to understand how the devices function under their actual operating conditions. They further suggest that advances in fast AFM imaging that enable capturing the time-dependent electrical behavior of perovskite solar cells, will be the next step towards revealing their unknown fast electrical mechanisms.